Ms Vicziany started with a few jars, a wooden box, and built the gift from there. IT'S the $35 gift that's inspired busy mums everywhere - a trio of handpainted jars filled with goodies and assembled with love by five children for their precious grandma's birthday. Western Australian mum Tammie Vicziany came across the idea while searching home decor online in the wee hours of the morning, and knew her mother-in-law would love it. 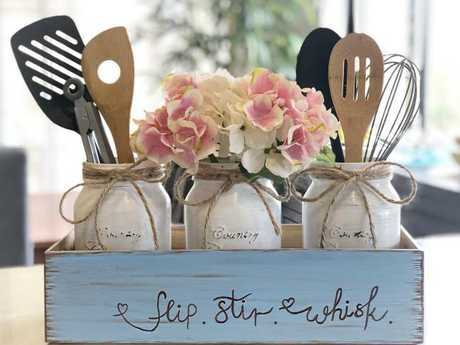 "Other than the idea - I found the 'flip, stir, whisk' jars in a box on Pinterest while searching farmhouse decor at 2am one morning. "It seems with five kids, that is the only time of the day when I can have some 'mummy chill time'. 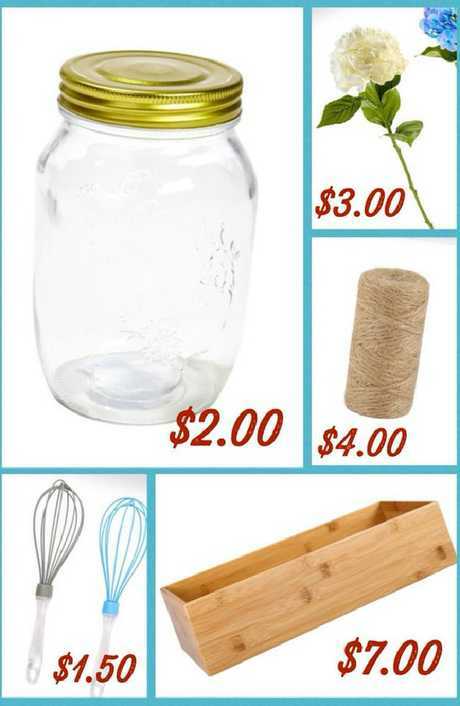 "I enjoy crafting and I've found a lot of the farmhouse decor items are easy enough to make yourself at home and best of all, it's really very cheap." 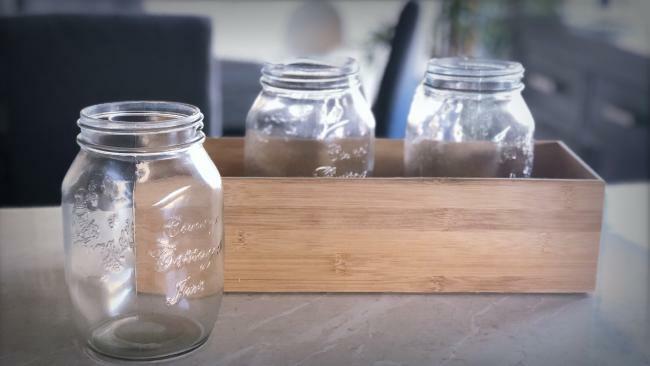 She said the jars, wooden box and cooking utensils cost her about $35 - a lot less than she would have spent if she'd just bought something from a store. "But handmade gifts are priceless," Ms Vicziany said. A few cheap items from Kmart was all she needed to get started. "My mother-in-law is so hard to buy for - it seems she already has two of everything. "This makes gift giving hard, especially for someone I care a lot about, as well as want to impress - she is my mother-in-law after all. "All I want to do is give her something that reflects how much she not only means to me, but to her son and our children." And with budgets tight, craft can often be a great alternative - and one inspiring the masses, with Ms Vicziany's project attracting thousands of likes and comments on social media. 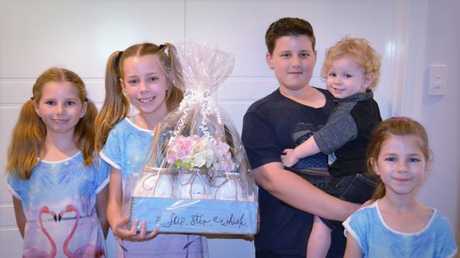 Tammie Vicziany has five kids, and they all got involved in making the present. "Like many Australian families, we also don't have a lot when it comes to funds for the nicer things in life, like being able to spend as much money as we'd like on the people we love," she said. "But one thing I can do is anything craft or arty - and what better gift than something homemade? "I was so surprised to see such a huge response online over this gift, but I was pleased to see others liked what we had made." Ms Vicziany said the kids loved making the gift for their grandmother. 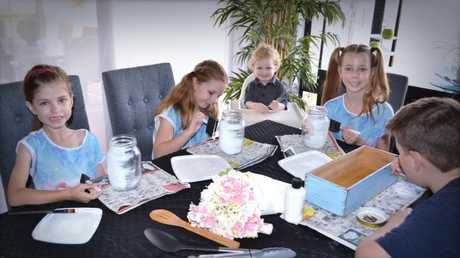 She said her children, aged 13, 11, 9 and 7 and 18 months, painted the jars and helped her put the present together. "Once we had collected everything that we needed to make the gift, I then set my kids up to paint the three jars and the wooden box over the weekend," she said. "When they were done, I took over and finished off with the details of the box and tied bows of jute rope on the jars. "It was so easy to put together - I really could have just let my children complete it themselves, but it was a joint effort, we all put love into this gift and I'm very happy with the result. The final gift turned out beautifully. "There are a few imperfections, but that's what gives it character. 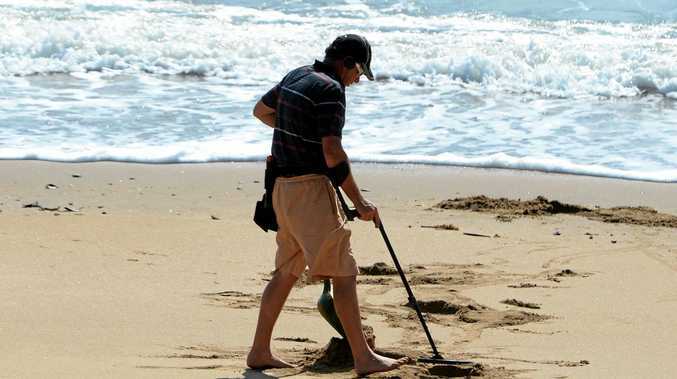 "We had a lot of fun making it and I really think my mother-in-law will love it too. "She loves her grandkids, so knowing they helped put it together will make it a very special addition to her new butler's pantry."